Here at Sugarhouse Stationery, nature is weaved into every single thing we do. We take so much inspiration from the outdoors during each season; the fresh blooms in the spring, the cool waters in the summer, the colorful foliage in the fall, and the sparkling, snow covered landscapes in the winter. Each season has so much beauty, but it can disappear so quickly! But, if we can take hold of that beauty, and re-create it as art; no matter what the season, it has a place for us to see it and remember it forever. The same can be said for your wedding day. The day is planned for months ahead of time, and it's filled with so much beauty and love! But, in the blink of an eye, the day is over and you can't believe that it has gone by so soon. My goal is to help create the feeling of your day through my art and design, and capture it on paper. That way, the feeling, energy, and pure essence of your wedding day is held forever in your stationery. You feel it as we move through the design process, and your guests can see it when they open their envelopes. Here is calm so deep, grasses cease waving. . . Wonderful how completely everything in wild nature fits into us, as if truly part and parent of us. thrilling, tingling, vibrating every fiber and cell of the substance of our bodies, making them glide and sing. is our song, our very own, and sings our love. As artists, my husband and I have very particular taste and of course had a lot of ideas for our wedding invitations. Maddie was able to create an invitation suite that not only suited our vision, but told our story in the most adorable way. She combined our illustrations with her design and typography expertise, making stationery that truly set the tone for our special day. In addition to creating a beautiful product, Maddie was an absolute professional. She is a delightful person, and was so patient with us. She made sure we were getting exactly what we wanted, offering several options and making edits until the design was absolutely perfect. If you are looking for invitations as special as your relationship, Sugarhouse is the way to go! Sugarhouse Stationery did such an awesome job on our invitations! Before I found Sugarhouse Stationery I was not excited at all about invitations, I was planning on something generic that wouldn't be a lot of time and effort - one of those places anyone can go online and do the same old thing everyone is picking. Then, I found Sugarhouse Stationery and once the process got started, I was hooked and VERY excited about our invitation suite. I met with Maddie who went over how the process would work; I accepted and we got the ball rolling. I was kind of late to the party in the wedding time frame for invitations, so it was a little bit of a crunch, but Maddie made it happen, and we got our invitations out by my goal date! Maddie listened to my ideas and was creative and helpful with suggestions, but not pushy in any way. We live in Boston, so you definitely don't have to be local for the process to work. My only complaint is that I absolutely LOVED every option she gave me in the end, so choosing was really difficult. Our invitations are unique and tie in with our theme even better than I had envisioned at the start. I can't wait until the RSVPs start coming in and I hear what people think of them. Who knew I would actually be excited about invitations! I think I'll probably even frame one - they are that good! I am completely happy with the experience, the product, and Sugarhouse Stationery. Maddie was so amazing to work with! She is such a pleasure and really listens to your vision and incorporates your ideas and opinions. Her creativity is outstanding and her work is just beautiful. My fiancé and I loved working with Sugarhouse Stationery on our Save the Dates! Maddie was extremely professional and patient with us throughout the process. She very quickly was able to understand the look and feel that we wanted and found ways to incorporate ideas from both of us. It did not take us long to narrow in on a design. What really made the Save the Dates special were the little creative touches that Maddie added in to make the design less generic and really stand out. Maddie's attention to detail and suggestions along the way made what I imagined to be a very daunting process extremely simple and fun! Read more of our recent reviews! Originally from Easton, Pennsylvania, Maddie is now living and loving life, working as a Freelance Graphic Designer in Manchester, New Hampshire. After graduating from the Communications Design program at Syracuse University, Maddie moved to Vermont to pursue her dream of working and designing for a local snowboarding company. After seven beautiful years in Burlington, Maddie moved to Manchester, NH with her husband and dog on a new adventure! Weddings became somewhat of an obsession after Maddie started working a part-time weekend job at a wedding venue in Vermont during the year of 2012. She was working as a waitress catering all different types of weddings. 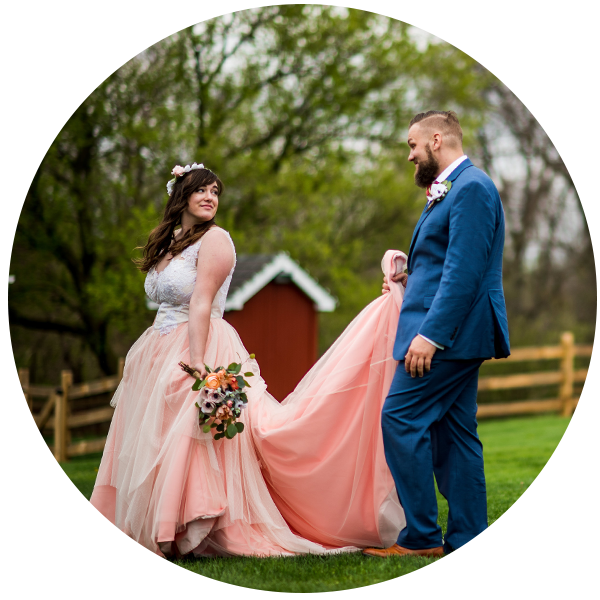 She loved seeing the differences between each event and the unique decisions that brides and grooms had made for their special day. The emotions from the family and friends of the Bride and Groom were so strong, that she even shed a tear or two during the course of the night. And, she didn't even know them! After working these magical weddings for four years, she was hooked. After her engagement with her now-husband, Collin, Maddie started dreaming of their wedding invitation suite. Save the dates, invitations, menu cards, table numbers, ceremony programs were all dancing in her head. As she moved through the design process, Maddie realized how much she loved putting her creativity into beautiful stationery that truly reflects the couple and their vision for their day. Could this be a business opportunity? What a dream! A new business is born! Sugarhouse Stationery is the result of a fleeting dream that is now becoming a reality. Maddie's main goal with this business is to create beautiful stationery for all kinds of couples that reflect their personalities and their visions for their wedding day. The priority is to not only bring couples joy when they see their stationery, but to create art and designs from the heart. The same emotion and thought that goes into writing wedding vows will go into every piece of stationery that I create. It is my mission to provide thought provoking, emotional, beautiful designs for each one of my customers. Maddie at Sugarhouse Stationery will walk you through the entire design process, help you with your invitation suite timeline, and guide you to make the best choices for your special day. Whatever you want to achieve with your wedding stationery, Sugarhouse Stationery is here to help you. Visit our Contact page to drop us a line and keep up with our blog to see what we've been most recently woking on! I would love to hear from you about all of your stationery needs. Feel free to fill out the form to the right. Once you submit it, it will automatically email me and I can get right back to you! Thank you! Have some questions and want to chat? Feel free to schedule a call with me by clicking the button below! Sugarhouse Stationery is located in the beautiful state of New Hampshire about an hour away from Boston!